The holidays are just passed us as we look towards a new year. This time of year people get really excited for a new beginning or maybe just their next chapter. Well, NBA teams also get excited for the New Year. A new year brings the trade deadline closer, the NFL ending it’s season, the NBA All Star weekend, and the time we all look forward to, the playoffs. Below we will run through new years resolutions for all 30 NBA teams. This was the perfect team to lead off because they have to just keep taking it a day at a time. Many didn’t like the Hinkie process but Joel Embiid has been showing fans and media all season long to Trust the Process. We haven’t even seen Ben Simmons on the court yet. The most impressive aspect of this rebuild for the 76ers is their assets (Philly owns the Kings 2019 first round pick and right to swap in 2017). They will most likely move one of their big men (Nerlens Noel or Jahlil Okafor) for so much needed guard help. Ben Simmons will be an excellent guard in the league but they will need some help. Their resolution is to get good value in Noel/Okafor and acquire a young guard who has potential. Trade. They have to move Brook Lopez for a package of picks and prospects. He’s averaging more points per 36 minutes than he ever has. On top of this, he established a three-point game. The Nets are an older team and they only have eight wins. It’s time for this organization to acquire young talent and draft picks. They can move Brook to a team contending for a playoff spot (more on this later). Time to trade Brook before he hurts his foot again. This team lacks stars. Their past few draft picks haven’t taken the steps the organization has expected. However, for some reason, players love the city of Miami. It’s obviously tough with Chris Bosh being out. However, the Heat are trying to get out of that contract. This won’t save them. They still have $62.7 million committed to Hassan Whiteside, Goran Dragic and Tyler Johnson. That is not a trio to compete with the best. Miami has to hope that one of their prospects turns into something special. The Magic’s only New Year’s resolution is playoffs. This franchise took a gamble on some free agents and made trades to acquire others. So far they have enjoyed the Eastern Conference because they are only two games out of the 8th seed. No one averages over 18 points per game on the Magic and no one carries a PER in the 20’s. Orlando has young prospects not getting any playing time and Jeff Green (24 mpg), DJ Augustin (20 mpg) and Jodie Meeks (19 mpg) combining for 26 points per game. This team needs the playoff experience for their younger players like Payton, Fournier and Gordon. Heck, even Bismack (24 years old). This team is going to work on their chemistry for 2017. Since Reggie Jackson’s return, the Pistons are 4-9 during his first thirteen games back from injury. During that stretch the Pistons beat the Cavaliers and lost to the 76ers. There are definitely flashes of this team’s talent and playoffs are within reach for them. They just need to figure out their rotations and familiarity with one another. Indiana needs a second star for Paul George. No player in the NBA can do it on their own. Thaddeus Young, Monta Ellis and Jeff Teague are all nice players but they aren’t all-stars. Myles Turner is turning (sorry for the pun) out to be a good selection but he is only 20 years old. Luckily for the Pacers, they have a lot of cap friendly contracts. The trade for Jeff Teague doesn’t seem to be working out but he is an unrestricted free agent come this summer. The Pacers need to be active in trade talks to keep Paul George happy. Trade John Wall. Obviously you shouldn’t do this because he is one of those rare talents. They will not get a John Wall in return if they trade him but the fan in me wants John Wall to be released. In reality, this team needs depth. The Wizards should keep an ear to the ground for any disgruntled veterans who can come off the bench. Their number one scorer off the bench is Marcus Thornton averaging less than seven points per game. This team has a five-man rotation at this point with all five starters averaging over 31 minutes per game. The Wizards resolution is a bench. The only category that stands out for the Chicago Bulls is their 6-10 road record. They are 10-6 at home, 4-4 in their division and 12-9 in their conference. They have the hardest division in the Eastern Conference. The Bulls also need consistency, most notably from Rajon Rondo. This roster isn’t going to change as John Paxson reminded, “Our roster is what it is.” The Bulls need their players to get going and find their rhythm. They are 5-3 when Mirotic scores 15 points or more. Rajon Rondo has averaged 9 assists per game in Bulls victories and only 5 assists per game in losses. The Bulls just need to get some consistency. Jason Kidd is going to need patience. This Bucks team is a two-man show right now with Giannis Antetokounmpo and Jabari Parker. They combine for 43.7 points per game while no other Buck averages in double figures. This team is missing Khris Middleton. They aren’t getting much out of their big men but one thing they can hang their hats on is they are top 10 in Opponents points per game, points differential and opponent’s shooting percentage. The Bucks will fight for the 8th seed unless one of their young stars goes down. If that happens, they can look towards the lottery. Their resolution is get Khris Middleton back. Whatever happened to the hot start for the Hawks? They were 9-2 at one point with wins over the Rockets and Cavaliers. Today they are .500 and lost to Minnesota twice. The Hawks take only 84.8 field goal attempts per game, good for 21st in the league. They are terrible at three point shooting which is strange for a team carrying Kyle Korver. They are ranked 29th in three point shooting percentage. The Hawks only have one player with over 30 starts as Mike Budenholzer is trying to find the right rotation. The fan base is discussing trading Millsap. This team can either move Millsap and build around Dennis Schroder or acquire some outside shooting to compliment Millsap, Howard and Schroder. Their resolution is figure out which direction they want to go. It has been a while since the Knicks were over .500 and eyeing home court in the first round of the playoffs. Well here we are. However, digging a little deeper it isn’t as rosy as one may think. Out of their 16 wins, only two of those teams have a record better than .500 and two have records at .500. What the Knicks need to do is overcome a playoff caliber team before I can start believing in them. Their resolution next year will be to show me that they belong in the playoffs. What makes the Hornets so interesting is they are winning despite having a superstar. Only problem is they do have one superstar and it’s about time people start to notice. He has continued to improve each season. He is shooting the ball better than he ever has (45.9% FG and 40.9% from three). The Hornets need to look to be buyers at the trade deadline for another all star caliber player. The Hornets are another team that is lacking a quality win. They’ve beaten the teams below them on this list but they have not beaten any of the teams in the top three seeds in the Eastern Conference. New Year’s resolution: don’t waste Kemba Walker. The Celtics are sitting pretty with a 19-13 record, good for the third seed. This is where many predicted they would end up but if you talked to anyone in Boston, this record isn’t good enough. And they are right. The injury bug has bitten Boston with Al Horford (10 games), Isaiah Thomas (4 games) and Jae Crowder (8 games) all missing time. They are 16-9 in their last 25 games. Boston just needs to stay healthy and keep their ears open to which all-stars become available at the trade deadline. You never want to burn your players out before the playoffs. The Raptors have been hot this season. They sit one and a half games out of first place and desperately want home court advantage throughout the Eastern Conference playoffs. 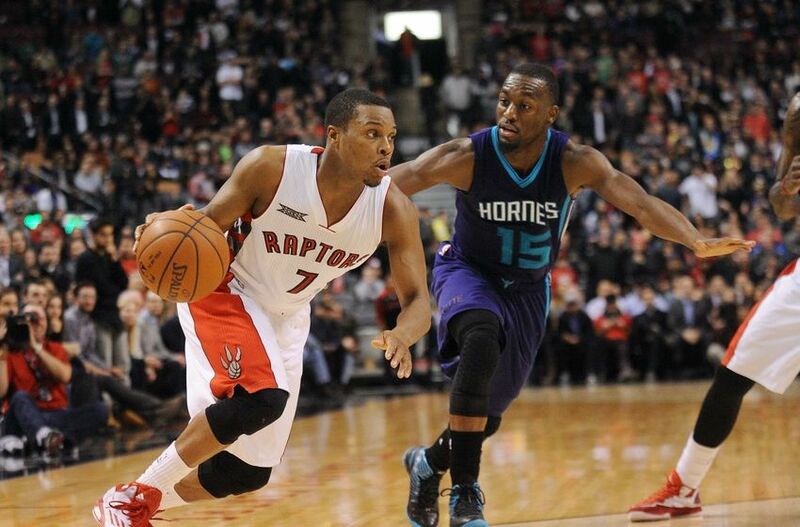 The problem is, they cannot play DeMar DeRozan (35.4 mpg) and Kyle Lowry (37.1 mpg) as much as they do. They will break down, as the playoffs get closer. The Raptors play a lot of small ball with only two of their top 8 players for most minutes played are Power Forwards or Centers. The Raptors resolution should be to look for bench scoring and other ways to rest Lowry and DeRozan down closer to 30 mpg. There is only one other player in the top 20 scorers playing more minutes per game than Lowry and that is Anthony Davis by .2 minutes. The only other players who are 30 and older on this list are Lebron James and Carmelo Anthony, two players that have much bigger bodies than Lowry. There really is nothing this team needs to do besides not get injured and make sure they rest their big three. Developing the rest of the roster will be important to. Every postseason the championship team has a couple of plays that are made by the role players that swing or save a game. During the season is where you want get those guys minutes. Their resolution is keep Lebron healthy and don’t be so hard on Kevin Love when things go bad.